I read this article and found it very interesting, thought it might be something for you. The article is called Off The Cuff: Dublin Comedy Improv 21st Birthday and is located at https://www.totallydublin.ie/more/comedy/dublin-comedy-improv-21st-birthday/. Dublin Improv celebrates its 21st birthday this month and in honour of one Dublin’s longest running comedy clubs I had a chat with members Ian Coppinger, Tara Flynn, Danny Kehoe, Sharon Mannion, Kevin Gildea and Dermot Whelan. Originally borne out of a workshop, Dublin Improv now has a pool of nine players, four or five of whom perform per show – I tried to find out what creates their winning formula. What makes an Improv show great? SM: During our Christmas show the three wise men arrived on segways. That was a personal favourite. Are there any couplings or groups that play particularly well off each other or others that you have to avoid? DK: No, not really, everyone gives you something different, but there are some people that I do particularly like to do scenes with. These are usually people that give you permission to be or do whatever you want. Sometimes I feel like a bold boy who is testing how far they can push it before their mammy gives out to them. TF: It can be difficult to play with someone you don’t know, but it’s an interesting challenge. Finding people who are good improvisers, funny, generous on stage and with whom you “click” personally is a tall order. That’s why our lineup changes so rarely: we’re really lucky to have the people we have. What makes the Improv so special that you’re still going 21 years later? IC: Improvisation involves the audience is a really nice way. They are the fifth Beatle, so to speak. Without them we are nothing and that makes it special. DK: The audience is a vital part of it, we need their suggestions, so there is no picking on people, it’s all very friendly. The audience is like the petrol and we are like the car. We need each other to get through the journey. I’ve heard people coming out of stand shows saying they did or didn’t like so and so, but it’s not the same with Improv because the audience can directly affect the show. They get to say crazy stuff, we get to say crazy stuff yet no one bats an eyelid. KG: As a stand-up comic I go to improv to really enjoy laughter – there’s a looseness and possibility of surprise you don’t often get in stand-up. What do you think about the Dublin Improv scene, what do we need to get Improv to the next level like it is in the States? DK: I studied at Second City and iO Theaters in Chicago and gigged all over the states. The scene is very different there, comedy is more established. Comedy in Ireland isn’t that old, it only started in the late 80’s so it’s a privilege to be on stage with some of the founding fathers of Irish comedy. 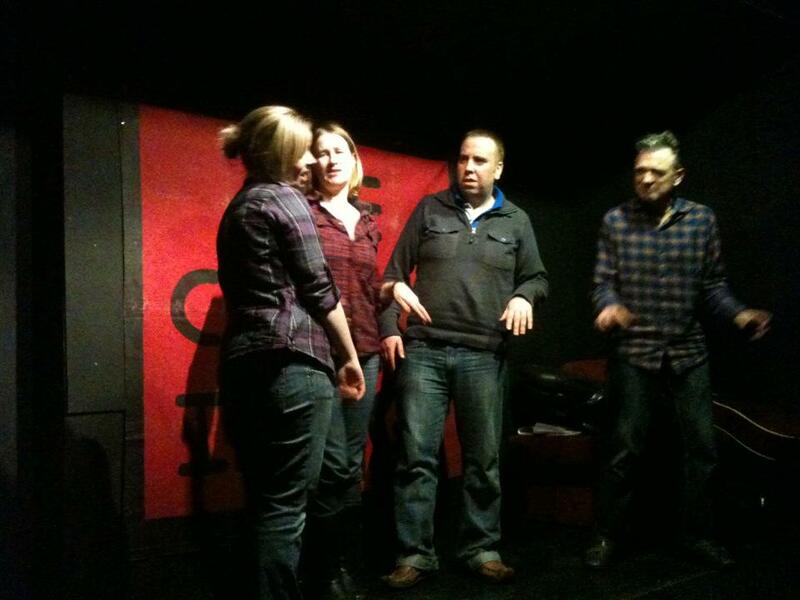 Most of the Dublin Comedy Improv were involved with the comedy movement in this country. It’s hard to believe that 25 years ago the only entertainment in the pubs and clubs was music, so we have come a long way. SM: People in general don’t seem to be aware of improv, which is such a shame as generally anyone who comes to see it is won over! It’s all about getting the word out there which should in turn result in more groups and more shows. Practically, if there was more improv on TV it would probably have a knock on effect on the popularity of the form in general. Dublin Comedy Improv will be making funny stuff up each and every Monday night, upstairs in the International Bar on Wicklow Street, Dublin 2. Entry is €8/€7 concession and proceedings kick off at 9pm.